SPRINGFIELD, Mass. – Myles Stute’s goal was to try holding DJ Jeffries to 15 points or less. That didn’t work out as the 2019 Memphis forward commit finished with 22 points and seven rebounds. But after the 6-foot-7 Jeffries got off to a fast start, the 6-foot-7 Stute was able to keep him in check for the most part and help lead Gonzaga College High School to a 69-56 win over Jeffries’ Olive Branch squad at the HoopHall Classic on Saturday night. 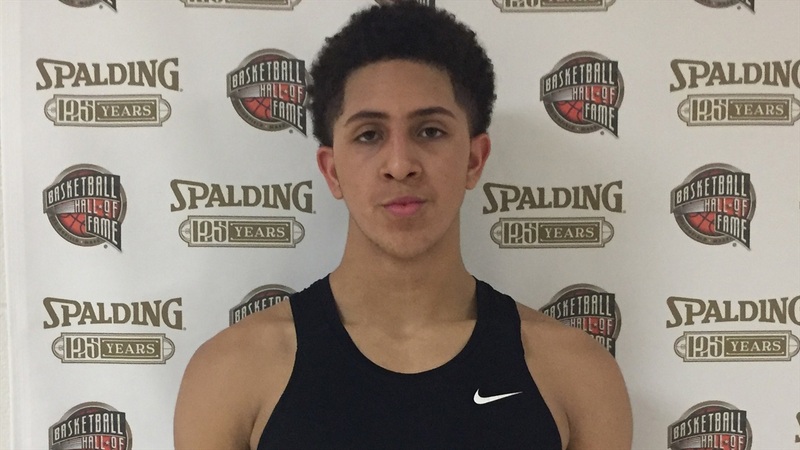 The 2020 forward already has double-digit scholarship offers from schools like Georgetown, George Washington, George Mason, Penn State, Seton Hall, Oklahoma State, UMass and Penn. He continues to receive interest from other schools as well like Clemson, Louisville, Marquette, Xavier and Notre Dame among others. “It’s going pretty good right now,” he said. “It’s starting to pick up a lot. I’m getting a lot of interest from high-majors, so it’s coming in. I’m feeling good. Stute’s last visit was an official to Penn. He’ll have to balance looking at an Ivy League school with a high-major. He’s being recruited by multiple ACC schools. Notre Dame could also offer the chance to return to the Midwest. Last month, Stute said he heard from Irish assistant Rod Balanis.